A few weeks ago, I stopped into my local State Farm office to steal a cup of coffee. You might recall me talking about it here. But that was merely the tip of the iceberg. Immediately afterwards, I started plotting something even more daring. What would happen if I walked past somebody dining outdoors at the restaurant around the corner, I wondered, and grabbed a tater tot off their plate? I decided that I absolutely, positively had to do this. Call me a daredevil. A prankster. A student of human nature. I make really weird bucket lists, I know. Because it’s easy to talk yourself out of doing something unless there is accountability, I told a whole bunch of coworkers about my plan. Even though they had witnessed me pilfering coffee firsthand, not a single one believed I would actually steal somebody’s food right off their plate. Which made me want to do it that much more. I walked past the restaurant, and there were two separate tables with diners eating tater tots. I still wasn’t 100% sure I was going to do it, but then a coworker wanted to grab coffee. I told her that sounded good, but we had to walk past the restaurant so I could steal a tater tot. Naturally, she did not believe I was going to do this. Hey, Sarah: told ya so! We walked by, and the same two pairs of diners were still there. The first ones were paying their check, and the tots were gone. Dammit. But the second pair were still there. Deep in conversation, laughing and taking sips of water. Right there, in between them, a half-full plate of tater tots beckoned. Previously, when I’d planned this out, I figured my safest bet would be to grab a tater tot and run. Because, remember: don’t get murdered. But in the heat of the moment, I threw sense and logic out the door. Instead, I was amazingly calm. I stopped in my tracks, casually reached over, snatched a tater tot from their plate, and held it up for them to see, acknowledging the fact that it was, indeed, right there clutched between my fingers and not on their plate, where it belonged. I even grabbed it with my left hand, which I feel should earn me bonus points. “Thank you,” I said politely. Then I turned and strolled away. The looks on their faces were priceless. They stared at me, wide-eyed, caught between anger, amusement, and amazement. I think they were trying to decide whether to yell at me or burst out laughing. In fact, they never did say a word, just stared at me as I walked away with their stolen tot. I mean, what do you say in a situation like that? If it had been me, I probably would have laughed. Sarah, my coworker who witnessed the whole incident, was astounded by my bravado. “I never thought you’d actually do it!” she said. “I told you I would,” I replied. And that sums me up in a nutshell. If I put my mind to something, you can take it to the bank that I am going to go through with it. My word is gold. I try not to worry what other people think, and I am not afraid to step outside my comfort zone. Even at the risk of public humiliation. I rarely back away from a dare. I’m like Marty McFly in Back To The Future. Call me “chicken” and I’ll do my very best to prove you wrong. I figure I did those diners a favor. Now they have a great story to tell their friends and family. You’ll never believe what happened one time when we went out to lunch! We were eating tater tots when a stranger walked by and grabbed one right off our plate. Can you believe the nerve of that guy?! They’ll get mileage out of the retelling for years to come. As for me, I’m feeling pretty immortal these days. When I got back to the office, after showing the tater tot to my disbelieving coworkers, I ate it. 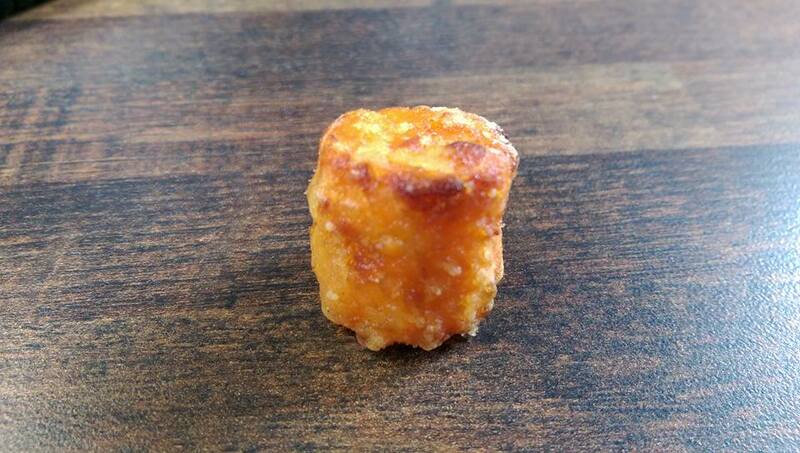 It turned out to be a sweet potato tater tot, which I’d never had before. It tasted extra delicious. And best of all, I did not get murdered. Ha!!! Mark, that is PRICELESS! And I say BRAVO to you! I consider myself very gutsy, but I don’t know if I could have done what you did. The whole time I was reading this post I kept thinking that you should have your own TV reality show (Mark My Actions) where you do this to various people and film their reactions! That’s the perfect name for the show, Ron! You’re a genius!! OMG……..hilarious! I’m trying to decide what my reaction would be to that stunt? I just don’t know! I have to believe that most people would find it amusing, but a friend on FB said she’d be pissed if somebody had done that to her…so I guess everybody’s reaction would vary. I think I’d be pissed, but the fact that you stopped, held it up, and said ‘thank you’ would have cracked me up. Cuz it’s just so bizarre! I agree with the above comments. I am a bit of germaphobe, so at first I’d be grossed out and upset, but that you stopped and said thank you would totally catch me off guard too.